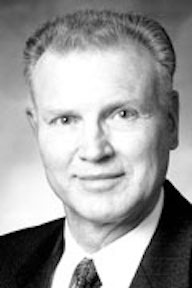 H. Bruce Stucki was a General Authority of The Church of Jesus Christ of Latter-day Saints from 1999 to 2006 as a member of the Second Quorum of the Seventy. He was presiding over the England Manchester Mission at the time of his call. Stucki was born on December 1, 1937, in St. George, Utah, and was reared in nearby Santa Clara. He earned his bachelor’s degree in business management from the University of Utah and worked in the food distribution business. He was the chief executive officer of RMC Foods for a time, as well as managing general partner of Rocky Mountain Company. He also worked in real estate development. He served on the St. George Utilities Commission and the Utah Board of Regents. he served with the Utah Partnership for Economic Development where he began the scheduled air service in Utah that later developed into Skywest Airlines. He and his wife, Cheryl, are the parents of six children. He has also served in the Church as a bishop, stake president, regional representative, and area authority. This page was last edited on 6 September 2017, at 13:18.